For other uses, see McKenzie River (disambiguation). The McKenzie River is a 90-mile (145 km) tributary of the Willamette River in western Oregon in the United States. It drains part of the Cascade Range east of Eugene and flows westward into the southernmost end of the Willamette Valley. It is named for Donald McKenzie, a Scottish Canadian fur trader who explored parts of the Pacific Northwest for the Pacific Fur Company in the early 19th century. As of the 21st century, six large dams have been built on the McKenzie and its tributaries. After the South Fork confluence, the main stem of the McKenzie River continues west through a narrow valley in the mountains, receiving the Blue River from the north at the community of Blue River. The McKenzie then passes Vida and continues to Leaburg and Walterville. The McKenzie valley widens as the river continues west, receiving the Mohawk River from the northeast just north of Springfield. Emerging from the Cascade foothills, the McKenzie enters a broad floodplain. It joins the Willamette River from the east 5 miles (8 km) north of Eugene. The McKenzie River drains a region of about 1,300 square miles (3,400 km2) and is one of the primary tributaries of the Willamette River. Elevations in the watershed range from 10,358 feet (3,157 m) at the summit of the South Sister to 375 feet (114 m) at the McKenzie's mouth on the Willamette River north of Eugene. The upper basin, in the high Cascades, consists of granular, permeable igneous rocks that are geologically young, while most of the middle and lower McKenzie valley in the Western Cascades is made of the remnants of older, more weathered volcanic rocks. Major watersheds bordering the McKenzie basin include the Calapooia; the South, Middle and North Santiam rivers to the north; the Middle Fork Willamette River to the south; and the Deschutes River to the east. Most of the watershed is lightly populated; about 70 percent of it is public land managed by the U.S. Government, of which about 39 percent is the Three Sisters Wilderness. Over 96 percent of the basin is forested, just under 4 percent is devoted to agricultural use—mainly farms and orchards on the lower floodplain—and the remainder is residential or industrial. Most of the public land is part of the Willamette National Forest and is important for logging and recreation. The river is the sole tap water source for the cities of Eugene and Springfield, fulfilling the water needs of about 200,000 people. The Eugene Water & Electric Board (EWEB) utility draws the water at river mile (RM) 11 or river kilometer (RK) 18 in Springfield. Water quality in the river is rated good to excellent, with better quality upstream than downstream. Principal sources of contaminants in the McKenzie are agriculture and residential development, including septic systems. Small amounts of herbicides detected in the river and some of its tributaries may be from aerial spraying by timber companies for forestry. The region has a temperate climate with wet winters and dry summers. About 90 percent of precipitation in the watershed comes between October and May. Precipitation in the basin varies greatly with elevation; about 40 inches (1,000 mm) fall annually in the Willamette Valley, while the Three Sisters in the high Cascades can receive 125 inches (3,200 mm) in a year. Above 4,000 feet (1,200 m), about 35 percent of precipitation falls as snow, and at 7,000 feet (2,100 m) and higher, over 75 percent of precipitation is snowfall. At these elevations, melting snow beginning in the spring season brings more cold water out of springs under the permeable rock, increasing the McKenzie's flow and maintaining cold water temperatures in the river and its tributaries. Along the lower McKenzie, however, winter rain slides easily off the less permeable rock and erodes sediment into the river. There are six major dams in the McKenzie River watershed—three on the river and three each on a different tributary of the McKenzie. The three dams on the McKenzie's main stem form Carmen Reservoir, Trail Bridge Reservoir, and Leaburg Reservoir, respectively. The other dams in the watershed are the Smith River dam on the Smith River in the upper basin, Cougar Dam on the South Fork McKenzie River, and Blue River Dam on the Blue River. The Carmen Diversion Dam is the uppermost dam on the McKenzie, located less than 2 miles (3.2 km) south of Clear Lake, the McKenzie River's source. Water from Carmen Reservoir is diverted southwest through a tunnel to Smith Reservoir on the Smith River. Through both the Smith River and another tunnel, water in Smith Reservoir moves south to the Carmen Power Plant, then into Trail Bridge Reservoir—which the McKenzie joins—and through the power-producing Trail Bridge Dam. The engineered system is called the Carmen–Smith Hydroelectric Project, and it has been used by the Eugene Water & Electric Board since 1963 to generate electricity for EWEB customers. The system's generating capacity is 114 megawatts (MW). EWEB also owns and manages two power-producing canals farther downstream along the McKenzie River. The Walterville Canal, completed in 1910, and the Leaburg Canal, completed in 1930, each contain water diverted from the McKenzie to produce electricity. Most of the water is returned to the river after power production. The eastern portion of Oregon Route 126 passes through the valley of the McKenzie River, closely following the river for much of its route. 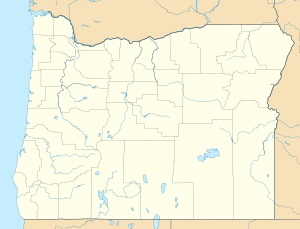 The 60-mile (97 km) stretch of the river from the edge of the Springfield metro area eastward to the Cascades is known as the McKenzie Valley. The following communities, listed west to east, are in the valley: Cedar Flat, Walterville, Deerhorn, Leaburg, Vida, Nimrod, Finn Rock, Blue River, Rainbow, McKenzie Bridge, and Belknap Springs. For about 8,000 years, the McKenzie River has been home to Native Americans. In more recent history, Kalapuya and Molala tribes lived nomadically in the summer and spent winters in the lower valley. This way of life continued until the mid-19th century, when many natives died of disease or were relocated to reservations. The first recorded exploration of the river occurred in the spring of 1812, when the Pacific Fur Company reached the McKenzie via the Willamette River, as part of a larger exploration led by Donald McKenzie. The company had established a post in 1811 at Fort Astoria at the mouth of the Columbia River for the Astor Expedition. McKenzie, the following spring, formed a party to explore the Willamette River. The party found a large tributary of the Willamette River and named it after McKenzie. However, much of the McKenzie River remained largely unvisited by white settlers and explorers until October 1853, when a group of Oregon Trail settlers became lost trying to cross the Cascades into the Willamette Valley via the Elliott Cutoff. In 1910, travelers completed the first automobile crossing over McKenzie Pass. However, crossing along the river was limited to summer because winter conditions closed the pass. Year-round travel was not possible until 1960, with the completion of a road over Santiam Pass. Fish in the McKenzie River and some of its tributaries include spring Chinook salmon, mountain whitefish, and bull, cutthroat and rainbow trout. Dippers, mergansers, bald eagles, ospreys, and various ducks feed on the fish. The threatened northern spotted owl inhabits dense forest on the west side of the upper McKenzie basin in Linn County. Forests of Douglas fir, western hemlock, and western red cedar cover the vast majority of the watershed. The McKenzie River is popular for boating—especially fishing, kayaking, and whitewater rafting. The McKenzie River dory (or drift boat), specifically designed for use in whitewater, was first developed on the Mckenzie in the 1940s; adaptations of this design quickly grew in popularity on other Western rivers such as the Rogue and the Colorado. Boating is also common on Blue River Reservoir and Cougar Reservoir. Hiking and mountain biking are popular activities on trails in the McKenzie watershed. Trails include the 26.5-mile (42.6 km) McKenzie River National Recreation Trail, which follows much of the upper McKenzie. ^ a b c "McKenzie River". Geographic Names Information System (GNIS). United States Geological Survey. November 28, 1980. Retrieved August 7, 2010. ^ Derived from Google Earth search using Geographic Names Information Service (GNIS) source coordinates. ^ a b "Watershed Facts". McKenzie Watershed Council. Retrieved September 29, 2009. ^ a b "Water-Data Report 2013: 14165500 McKenzie River near Coburg, OR" (PDF). U.S. Geological Survey. Retrieved April 26, 2015. ^ "Indians, Surveyors, Incidents Gave Names to Streams, Lakes and Mountains". Eugene Register-Guard. January 4, 1942. p. 5. Retrieved April 26, 2015. ^ a b c "About the McKenzie Watershed". McKenzie Watershed Council. Retrieved January 9, 2010. ^ a b c General course info from USGS topographic maps accessed via the "GNIS in Google Map" feature of the USGS Geographic Names Information System website; and Oregon Road & Recreation Atlas (Second ed.). Benchmark Maps. 2002. ISBN 0-929591-50-X. ^ Dietz, Diane (August 15, 2006). "EWEB examines herbicides in the watershed". The Register-Guard. Eugene, Oregon. p. A1. Retrieved June 24, 2015. ^ a b c d e f g Williams, Gerald W. "McKenzie River". The Oregon Encyclopedia. Portland State University. Retrieved January 11, 2011. ^ a b "Smith Reservoir". Google Maps. Retrieved July 7, 2013. ^ a b c "Smith Reservoir (Linn County)". Atlas of Oregon Lakes. Portland State University. Retrieved July 7, 2013. ^ a b "Carmen Smith Hydroelectric Project". Eugene Water & Electric Board. Retrieved July 7, 2013. ^ "Oregon's McKenzie River Communities". McKenzie River Reflections. Archived from the original on February 5, 2012. ^ Munford, Kenneth. "The McKenzie River Trails". Benton County Historical Society & Museum. Archived from the original on November 14, 2012. ^ a b "McKenzie River Area". U.S. Forest Service. Retrieved May 12, 2013. ^ "McKenzie Bridge Campground". U.S. Forest Service. Retrieved July 7, 2013. ^ "Blue River Lake and Cougar Lake, Oregon" (PDF). U.S. Army Corps of Engineers, Portland District. 2009. Retrieved June 20, 2015. ^ "McKenzie River National Recreation Trail #3507". U.S. Forest Service. Retrieved June 20, 2015. Mackenzie, Cecil Walter (1937). Donald Mackenzie, "King of the Northwest". Los Angeles, California: I. Deach, Jr. OCLC 3023859. McArthur, Lewis (2003). Oregon Geographic Names. Portland: Oregon Historical Society Press. ISBN 0-87595-277-1. Morgenstern, Karl A.; Donahue, David; Toth, Nancy (January 2011). "McKenzie River Watershed Baseline Monitoring Report: 2000 to 2009" (PDF). Eugene Water & Electric Board. Retrieved June 24, 2015. Risley, John; Wallick, J. Rose; Waite, Ian; Stonewall, Adam (2010). "Development of an Environmental Flow Framework for the McKenzie River Basin, Oregon" (PDF). Scientific Investigations Report 2010–5016. U.S. Geological Survey. Retrieved June 20, 2015. Sullivan, William L. (2014). 100 Hikes in the Central Oregon Cascades (Fourth ed.). Eugene, Oregon: Navillus Press. ISBN 0981570178. Wikimedia Commons has media related to McKenzie River.